We all get one shot at this life of ours, and how you choose to use that time very much determines the legacy you leave behind. Do you want to be remembered as a good person or as somebody who made a real difference and actually changed lives through their actions? There is nothing wrong with the former, but if we all has that frame of mind the names Einstein, Plato, Freud, Curie et al would mean nothing. We all know somebody who is capable of great things but are not carrying it through. It can be even more frustrating if that person is somebody you have got to know through work and you don't have a close enough relationship to tell them how you feel. There is an easy solution to this; send them this remarkable attitude business ecards. 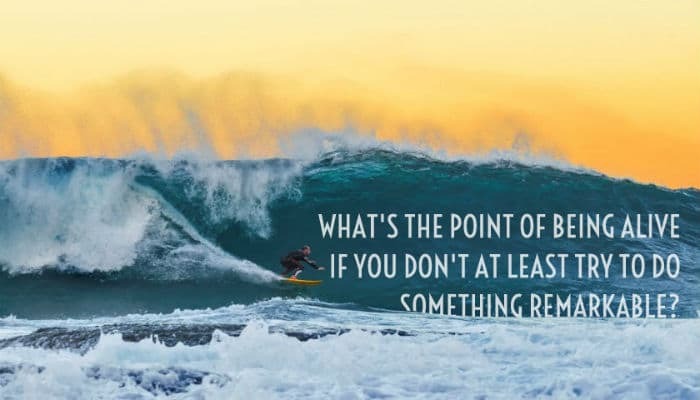 A lone surfer rides the crest of a wave, the text reads “What's the point of being alive if you don't at least try to do something remarkable?” The key word here is 'try'. Nobody wants to look back over their life in their twilight years and have it peppered with regrets and 'what if's'. Let them know you believe in them sometimes that is all it takes to do something remarkable.... We would love for you to see why our holiday ecards for business offer a remarkable opportunity to market your business this Christmas holiday season.